We cannot afford not to understand it, but Nazi Germany (1933- 1945) has always puzzled its historians. How could so many of such a civilized and well educated people as the Germans believe in Nazism? Initially most of these historians were outsiders, so the characteristics and the practice of Nazism, with at its depth the extermination of the Jews, struck them with full force. But inside Germany at the time, its full range did not become clear at one stroke. (And the ideology itself also evolved.) People got accustomed to it, in small steps. Most of these steps did not seem much. And one must eat, pass examinations, get a job, get married. They found themselves just normal, small people in a normal, small German town. It would be their children, who from about 1964 realised what their parents had done. But this book is published in 1955, halfway between the defeat of Germany and the new generation. In line with the war propaganda on both sides, the Second World War has been projected as the struggle between good and evil. It was. The evil at least was clear. A real insight into this period. It was all lost. Enemy forces, drunk with revenge for the destruction of their country, were approaching the capital from one side. Another enemy advanced from the other side, daily bombarding all strategic – and many times civilian – targets to break the spirit of resistance. In his bunker, the ageing dictator heard the rumbles of war getting closer. They were out for him, and nothing but unconditional surrender could stop them. This is not a recent description of Asad of Syria, Qadhafi of Lybia or, to take a quasi-state actor, the Tamil Prabhakaran in Sri Lanka. It is about their avatar, Adolf Hitler in Germany in 1944-1945. On 1 May 1945 Hitler committed suicide. Two weeks later it was all over with the unconditional surrender. Why did the German army not waive the white flag in July 1944 after Allied penetration deep into France had shown that the game was up? The German side kept on fighting, kept on executing opponents, murdering starved prisoners in concentration camps. What enabled the machine to tick on with such horrendous costs in lives and property in these last ten months? These questions are addressed in Ian Kershaw’s The End, Germany 1944-45. It treats the period from Von Stauffenberg’s failed assassination attempt of Hitler on 20 July 1944 till the end of the Third Reich in May 1945. It is not a military history. Kershaw concentrates on the attempts to preserve the power structure and to postpone economic collapse. His detailed and balanced history shows several factors at work. People and military alike felt that there was no alternative to continuing the war. Better an end with horror than a horror without end, was the general opinion. News from refugees from the east reinforced the idea that with the Russians endless horror was coming to Germany. There was jostling, even struggling for power, but this was confined to the very military and party top and the Fuehrer remained the ultimate arbiter. Society was taken over by the party and the Volkssturm, the national militia. There was no nucleus of resistance in religious or civil institutions. Military production was in steep decline and could not keep abreast of the losses of war. Collapse was postponed by Speer’s enormous power of improvisation. But after the failure of the capitation strike in the Ardennes in December 1944 the military, Kershaw writes, the regime’s only remaining goal was fighting to the last, whatever the cost. By February 1945 the soldiers blamed the party for the military situation, while the general population showed its German observers ‘profound letharchy’. The state became even more than before a top down imposition, whose orders were precise, but increasingly impossible to comply with. 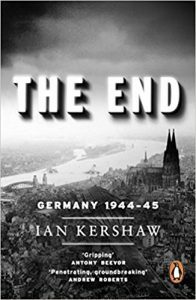 From January and February, when the war entered Germany itself, its people were subject to extreme repression not to give up, as Kershaw shows. It worked. In short, the defeat of the Nazi state came through relentless military pressure, it was not a systems collapse. Kershaw does not stop at this. His book also covers the immediate post war situation. At first quite some Germans denounced active Nazis, but as denazification progressed, past behaviour was collectively reinterpreted. ‘Nobody took part, everybody was persecuted and nobody denounced anybody’, wrote a lady about the people in the food queues of Berlin. 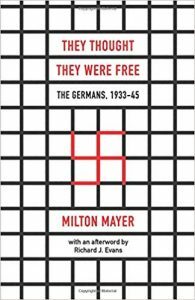 Surveys in immediate post war years revealed that the German people had reinvented themselves as ‘the helpless victims of a war they had not wanted, foisted on them by a tyrannical regime that had brought only misery’. They even were at heart opposed, a priest at Berchtesgaden knew, ‘our truly believing population, good middle class and farming families, fundamentally rejected Nazism’. Was it true? The war, especially the last months, had indeed been beyond control of the ordinary citizen. But, as Kershaw remarks, ‘few stopped to consider why they had allowed themselves to be misled and exploited’. In the long run, but outside the scope of this book, the German people would try to cleanse themselves by hard work (Wirtschaftswunder) and it was their children who took them to account, as witness among other developments the student rebellion of the 1960s. It took the Germans even longer to convince their neighbours, as there was sporadic mistrust even during the German unification of 1990. Of course, now very few if anybody doubts Germany’s credentials as a democratic state. The war and especially its last ten months had shown the paralysis of the German elite and the automatic response of its population to authority. It is Kershaw’s achievement to show the depths from which the democratic spirit in Germany had to rise. He has done so by sticking to the facts and without wagging the moral finger. I recommend the book.